First, slice your vegetables! Finely slice your clove of garlic and chop the shiitake mushrooms into large, meaty chunks. Remove the dry ends of both the baby leeks and spring onions before slicing them into bite size chunks, approximately 3-4cm long. Transfer half of one baby leek into a bowl along with the beansprouts and leave to one side for the garnish. Then take the rest of the sliced leek as well as the mushrooms and garlic and place on a separate plate, ready to flash fry. Next, make your egg mixture. Crack 6 eggs into a large mixing bowl, adding a dash of white pepper and approximately 1 teaspoon salt before beating the mixture thoroughly with chopsticks or a fork. Give the bowl a dash of sesame oil before beating once more. In a separate ramekin, make a cornflour paste by combining 2 heaped teaspoons of cornflour with a small amount of water, slowly adding more water until you achieve a smooth, thin paste. Add approximately 8 teaspoons of the cornflour paste to the egg mixture and stir through before leaving the bowl to one side. Save the rest of the cornflour paste for later! In a new ramekin, combine all of ‘The Sauce’ ingredients together, and again leave to one side. Add approximately 1 tablespoon of vegetable oil to your wok and bring it to a smoking point over a high heat. Add the sliced garlic and quickly stir through, before also introducing the sliced spring onions, baby leeks and shiitake mushrooms. Flash-fry your vegetables for approximately 2 minutes, then remove them from the heat. Grab your bowl of egg mixture and stir the vegetables through, ready to fry. Get ready to fry your eggs! Bringing the wok back to a high heat, add a ladle full of oil and swirl it around the whole pan, pouring the excess into a heatproof bowl to one side. Then, carefully place one ladle of the egg and vegetable mixture into the centre of the wok, quickly reducing to a medium-high heat to prevent burning. When the omelette-like mixture is roughly half-way cooked, it needs to be flipped. If you’re feeling confident, move the egg to one edge of your pan and use a quick wok-toss to flip it over fully; if not, simply use a spatula! Leave the mixture to cook for only 20 seconds more, then transfer to a serving plate. Repeat until all of your egg mixture has been used. For the garnish, add a drizzle more oil back to your wok and heat it to smoking point. 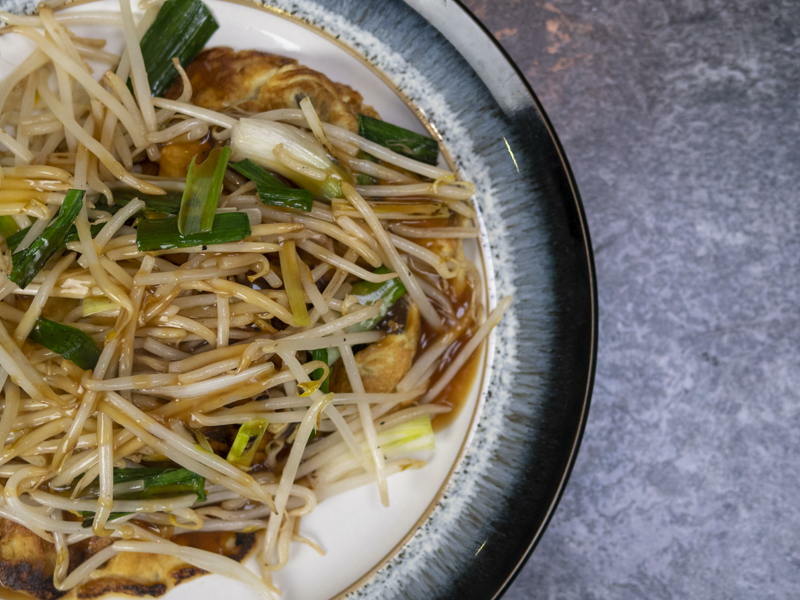 Add the beansprouts and remaining baby leek with a dash of salt, and stir fry for just over 30 seconds. Scatter the garnish over the serving plate, and you’re ready to finish off your sauce! Over a high heat, pour your ramekin of ‘The Sauce’ into your wok and add approximately 100ml of water, along with the remaining cornflour paste. Bring this mixture to a vigorous boil and leave it to reduce for about 30 seconds. Finally, pour the sauce over the top of the eggs and garnish, and serve.